1.Come with black, white,green,red 4 colors background backdrops and Micro USB cable(power bank NOT included),phone tripod,switch USB cable and pouch. 2.Non reflective,focusing your photography and earning more professional and more beautiful pictures. 3.Backdrop cloth lock: Lock the backdrop cloth to fixed. 4.Quickly setup to form a complete square studio box. 5.No bigger than a piece of paper when it is folded,easy to carry and storage. 6.The button instead of the magnet,makes the photography light box hold well. 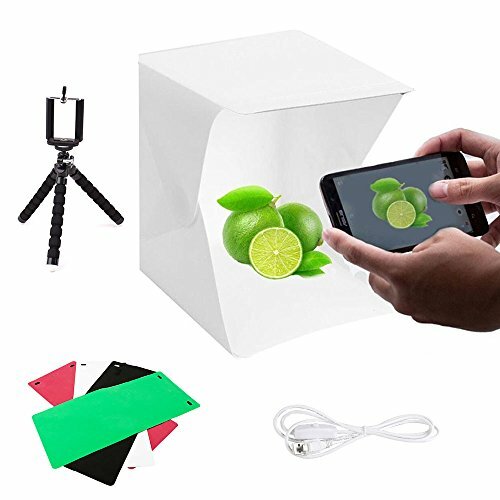 ☇☆ Come with Photography Studio Light Box,4 Colors Backdrops, adjustable Phone Tripod, Switch USB Cable and Pouch. ☇☆ 20 pcs LED light bulbs, provide sufficient brightness. Press switch comes steady soft built-in illuminant, portable with highly bright shooting effect. ☇☆ Adjustable column legs, mini ball head designed for 360-degree rotation and 90-degree tilt, allowing to get the perfect shot every time, best for product, portrait or landscape - ideal for indoor and outdoor activities. ☇☆ Not bigger than a piece of paper when it is folded. Built-in button for quick setup, collapsible design, space-saving and resist compression. ☇☆ For Photo Studio, Portrait Photography, Video Shooting,etc. This LED Photography Studio Light Box can be unfolded and placed it on any surface to get the perfect backdrop for small articles business photography, taking pictures for products selling online, especially for cellphone and accessories, fashion jewelry, small gadgets and so on. If you have any questions about this product by ZIKO, contact us by completing and submitting the form below. If you are looking for a specif part number, please include it with your message.